This weeks Thursday night game is an NFC West showdown with two teams looking to bounce back coming off disappointing defeats Sunday. With the Rams firing Jeff Fisher a few days ago, interim coach John Fassel’s was handed the shortest possible turnaround a team could be dealt. While the Rams have what it takes to play the Seahawks close, a recipe for disaster is also present. Aside from a nice first half against the Saints, there haven’t been a whole lot of positive takeaways from the Jared Goff era to this point. Now he gets to go into a hostile environment and face one of the league’s top defenses on a short week. In this scenario and given the play to go off of, Goff shouldn’t be considered for the fantasy playoffs in any league. Major things were expected for Todd Gurley in his first full NFL season, but to this point it has been a disappointment. Consistently facing eight in the box and without a very strong offensive line, it’s almost unfair to judge Gurley as a player given the situation he has been dealt this whole year. For fantasy purposes, he should still be worth inserting in lineups as he figures to see 20 or so touches, and always has the chance for goalline touches if they arise. One positive development for the Rams on offense this year has been Kenny Britt. Assuming he plays in the final three games, Britt is almost a lock to be the first Ram with over 1,000 yard receiving in a single season this decade (seriously). The last time these two teams played, the Seahawks didn’t have Richard Sherman shadow Britt and they paid the price. It will be interesting to see what the Seahawks do with few the Rams having few reliable options in their passing game. Tavon Austin figures to see some touches, but still remains a boom or bust option in all fantasy formats. Lance Kendricks is second to Britt in number of passes thrown his way since Goff has started, but the Seahawks should be able to keep him in check. The real x-factor in the Rams offense for this game could be 5th year receiver Brian Quick. While the opportunities remain inconsistent on a weekly basis, he has flashed the ability to make big plays and has the physicals skills you look for at the position. With the possibility of playing from behind, this could be a game where Quick can get more involved, but we may just have to wait until he’s in a new system. Depending on when you’ve seen them, the Seahawks offense can look like a juggernaut or out of sorts. Two of the last three weeks have fallen into the out of sorts category, and the Rams present a matchup that could continue the trend. The Seahawks struggles on the offensive line have been well documented and that happens to play into the strengths of the Rams which is their defensive front. On the other side of things, the Seahawks have played better offensively at home and the Rams have given up at least 26 in 5 of their 7 road games to this point. Russell Wilson has played very well at home this year, and with the Rams having little time to recover should continue that stretch. He is clearly much healthier than he was when these teams first played, so it will be interesting to see the difference that makes. Regardless, Wilson should be active if you have him for fantasy purposes. Since returning from injury a few weeks ago, Thomas Rawls has shown the ability that had so many high on him entering the season. 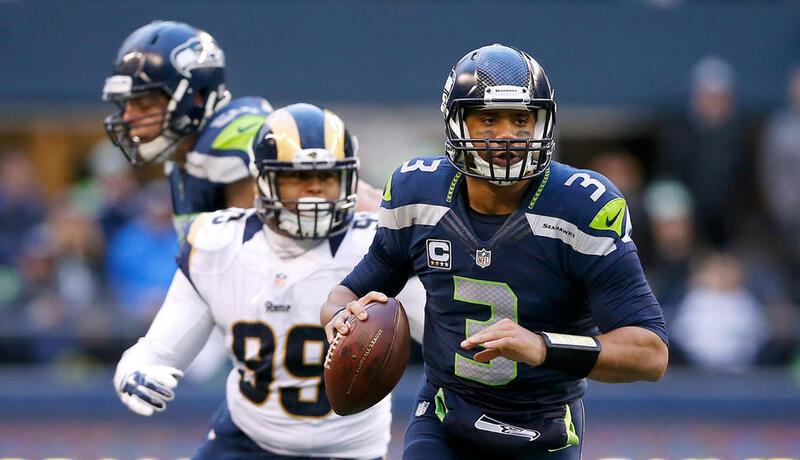 Averaging over five yards a carry in that span, Rawls is facing a Rams defense that despite their talent has been gashed at times against the run. Depending on the game script, Rawls could get more than 25 total touches and is worth starting in all leagues. While Wilson is known to spread the ball around, Doug Baldwin and Jimmy Graham have clearly established themselves as his two top options. Baldwin struggled when these two teams last played, but at home this year he has averaged over 90 yards a game. Due to the 8 to 10 targets that should be thrown his way, Baldwin is safe to start in all leagues. The Rams defense has been stingy against opposing tight ends all season, but despite that Graham should be started in all fantasy formats. He has once again established himself this season as a matchup nightmare, and is much more involved in the offense than he was when these teams met in week two. Tyler Lockett and Jermaine Kearse also figure to see balls thrown their way, but the week to week consistency makes them difficult to trust in what would be the fantasy playoffs. This entry was posted in Uncategorized and tagged 2016 week 15 fantasy football predictions, 2016 week 16 predictions, Brian Quick, Doug Baldwin, Jared Goff, Jermaine Kearse, Jimmy Graham, Kenny Britt, Lance Kendricks, Los Angeles Rams, NFL, Picks against the spread, Rams vs Seahawks predictions, Russell Wilson, Seattle Seahawks, Tavon Austin, Thomas Rawls, Todd Gurley, Tyler Lockett. Bookmark the permalink.